We recommend checking out our discussion threads on the Focal Press Handbook for Sound Engineers 5th 9780415842938, which address similar problems with connecting and setting up General Audio Tutorials Focal Press. The user manual for the Focal Press Handbook for Sound Engineers 5th 9780415842938 provides necessary instructions for the proper use of the product Pro Audio - Audio Books & Tutorials - General Audio Tutorials. 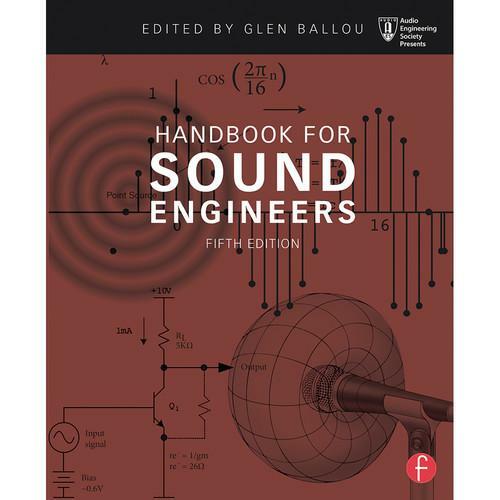 The Handbook for Sound Engineers 5th Edition from Focal Press is a comprehensive reference book specifically for audio engineers. With contributions from many of the top professionals in the field, including Glen Ballou on interpretation systems, intercoms, assistive listening, and fundamentals and units of measurement, David Miles Huber on MIDI, Bill Whitlock on audio transformers and preamplifiers, Steve Dove on consoles, DAWs, and computers, Pat Brown on fundamentals, gain structures, and test and measurement, Ray Rayburn on virtual systems, digital interfacing, and preamplifiers, Ken Pohlmann on compact discs, and Dr. Wolfgang Ahnert on computer-aided sound system design and room-acoustical fundamentals for auditoriums and concert halls, the Handbook for Sound Engineers is a recommended for serious audio and acoustic engineers. The fifth edition has been updated to reflect changes in the industry, including added emphasis on increasingly prevalent technologies such as software-based recording systems, digital recording using MP3, WAV files, and mobile devices. New chapters, such as Ken Pohlmann's Subjective Methods for Evaluating Sound Quality,S. Benjamin Kanters's Hearing Physiology-Disorders-Conservation, Steve Barbar's Surround Sound for Cinema, Doug Jones's Worship Styles in the Christian Church, sit aside completely revamped staples like Ron Baker and Jack Wrightson's Stadiums and Outdoor Venues, Pat Brown's Sound System Design, Bob Cordell's Amplifier Design, Hardy Martin's Voice Evacuation/Mass Notification Systems, and Tom Danley and Doug Jones's Loudspeakers. This edition has been honed to bring you the most up-to-date information in the many aspects of audio engineering. If you own a Focal Press general audio tutorials and have a user manual in electronic form, you can upload it to this website using the link on the right side of the screen. The user manual for the Focal Press Handbook for Sound Engineers 5th 9780415842938 can be downloaded in .pdf format if it did not come with your new general audio tutorials, although the seller is required to supply one. It is also quite common that customers throw out the user manual with the box, or put the CD away somewhere and then can’t find it. That’s why we and other Focal Press users keep a unique electronic library for Focal Press general audio tutorialss, where you can use our link to download the user manual for the Focal Press Handbook for Sound Engineers 5th 9780415842938. The user manual lists all of the functions of the Focal Press Handbook for Sound Engineers 5th 9780415842938, all the basic and advanced features and tells you how to use the general audio tutorials. The manual also provides troubleshooting for common problems. Even greater detail is provided by the service manual, which is not typically shipped with the product, but which can often be downloaded from Focal Press service. If you want to help expand our database, you can upload a link to this website to download a user manual or service manual, ideally in .pdf format. These pages are created by you – users of the Focal Press Handbook for Sound Engineers 5th 9780415842938. User manuals are also available on the Focal Press website under Pro Audio - Audio Books & Tutorials - General Audio Tutorials.